Thats it really. I had a brilliant idea and then it totally, utterly, and apparently irretrievably disappeared. Sorry. I know you would have loved it, it would have been the most scintillating, inspirational, intelligent, creative post I ever wrote in my life. I am quite sure of that. Instead we have this one, lamenting the lost post idea. I am thinking this is really pretty lame, in fact, how can you even know I had that idea to start with? There is no evidence of it here, I could just be ‘saying’ it was a brilliant idea when in fact I had been totally blank about that post all day. But thats just how it is and you will have to accept my word for it. I will however, consume one final coffee before totally giving up on that idea. Just in case it stimulates that specific pathway through my brain that triggered the ‘most amazing post in the history of the planet’ idea, in which case, you wont be reading this, but rather you will be transfixed to your monitor unable to take your eyes away from my blog and feeling the creative inspiration coursing through your mind as I share the utmost secrets of the universe and how to mould that into your own unique creation, which will, on completion, be so incredibly amazing that it will bring about world peace, harmony between humanity and mother nature, and above all a white Christmas with much revellry and hot choclolate with those little mini marshmellows that float around on top like melty little snowman rafts. At this point I guess we must accept that this is not going to happen. Although perhaps I can at least bring about the purchasing of mini marshmellows in anticipation of an hour or two of peace on earth and goodwill to all men sometime next month. In the meantime, all I am left with is to show you some slightly random pics of the ‘whats on my wheel tonight’ variety. Tonight I spun some incredibly fine and soft Polwarth, just recieved from the most fabulous Fine Fibres Farm in New Zealand. I had dyed it in batt form, and wanted to keep the colours a bit separated. 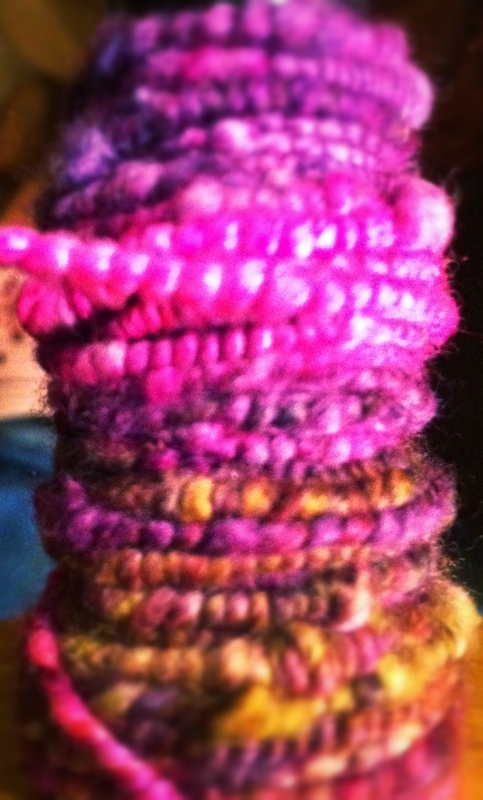 I spun a fairly fine but still textured single, then coiled it. Why? Just because I like how coiling a single seems to solidify and intensify the colours, and thats what I wanted to do with this fiber. Also, as this Polwarth really is incredibly soft (feels like the finest alpaca) I knew that even with a lot of twist in it, it would stay nice and soft, so I wanted to see how it would turn out!. 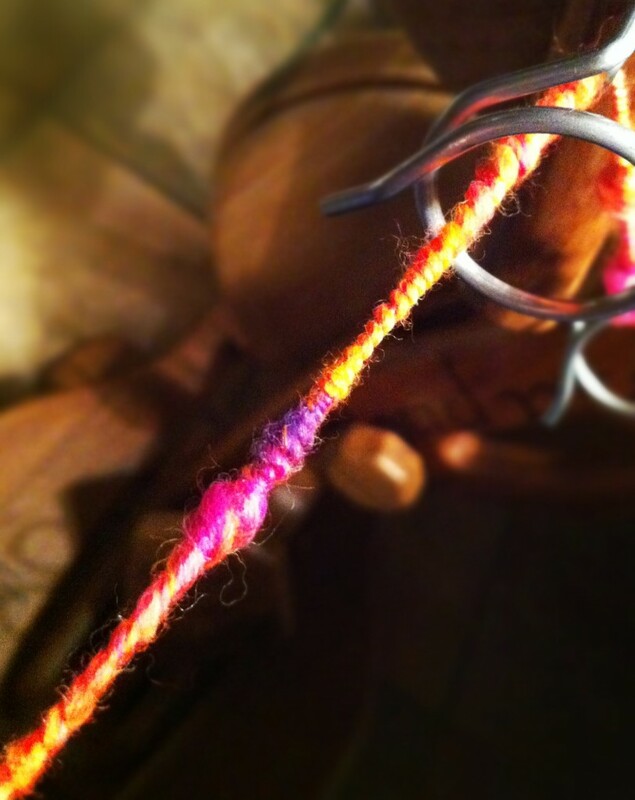 So, now I have a fast coiled yarn on my bobbin. But I am not finished with this yet! 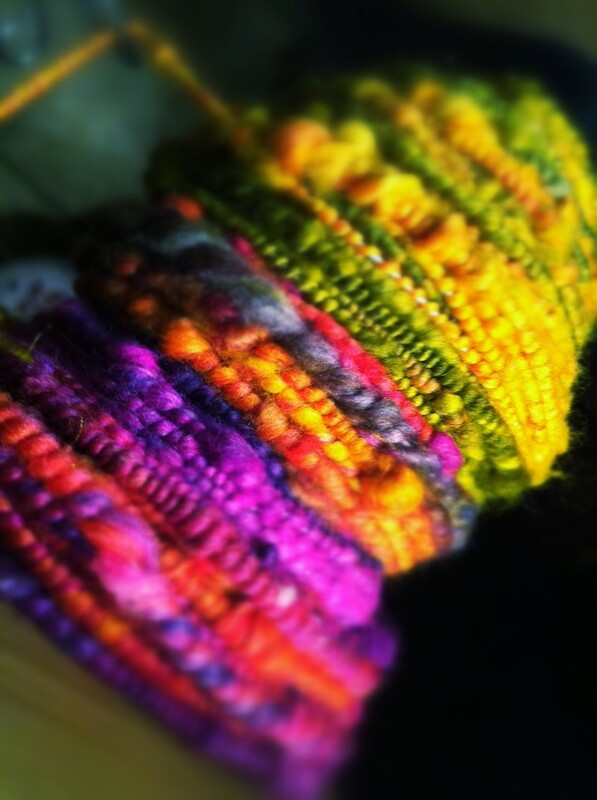 I am going to sleep on it now, but I am pretty sure there will be at least one more step to this yarn. I just havent decided what it is. And of course even if I did decide that NOW, doesnt mean I will remember it tomorrow right! So I am going to save myself the problem and just not think about this yarn again till I wake up in the morning. 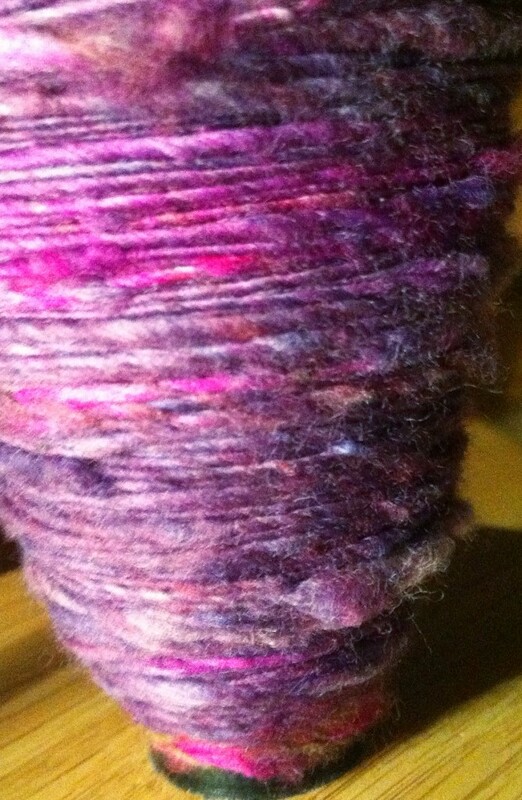 I hope I manage to remember that it is on the bobbin waiting! So what else happens to the yarn? It’s already making me drool! I think I will list the final ply in my shop, it would make an amazing no-knit scarf, or even a finger crocheted scarf, or a necklace/s its come out really pretty and super soft, it would feel lovely around the neck. I ‘might’ even make something myself for my Warped shop actually, I am thinking a neck and wrist set.. then I get to play with it longer! This is such an honest post!! How many times have all of us forgotten something so wonderful? How could this happen? Your yarn is beautiful and the colors yummy!! BEST POST EVER!!!! In fact, I think this WAS the forgotten post. You just forgot that it was. and that dear woolwench is the answer to all of my problems. 🙂 yep just spin and weave! The only things I really need to remember to do 🙂 Not that there is too much chance of forgetting that!